things that shine: eat, play, love: Bonnie's berry M.O. 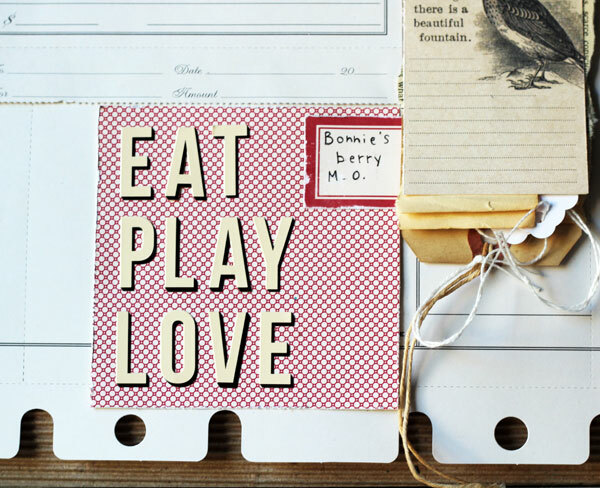 eat, play, love: Bonnie's berry M.O. Ruby Sky has a serious love for strawberries. When she sees them, she nearly can't contain herself. The look of serious, consuming bliss and concentration on her face when she eats is quite adorable. LOVED this die cut and perforated bank statemente paper by Jenni Bowlin Studios, and bought it, wondering if I'd ever actually use it. I decided not to overthink it, and loved the creamy white background for this photo of Ruby Sky eating a strawberry. I like that the little cut-outs in the bottom show more of the kraft corrugated paper background, too. 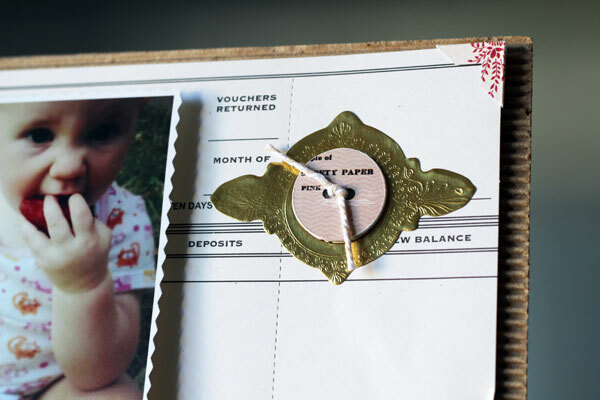 I also used a 4x4 piece of patterned paper from the mini pattern sheet; a receipt from the perforated diecut receipt paper; a red label from the Wren accessory sheet, a chipboard file tab and a cardstock file tab sticker from a Hodge Podge sticker sheet. 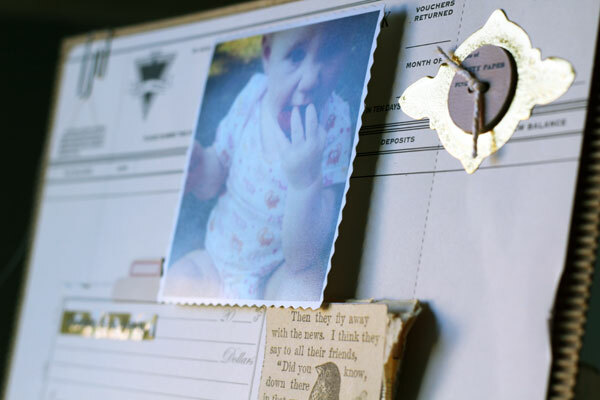 The little photo corner was punched from another mini sheet -- seriously cannot stop using this Martha Stewart photo corner punch, or using reduced size mini patterned paper sheets! These letter stickers are fun (also Jenni Bowlin Studio). Love the dimension added by the drop shadow effect. Such a nice, classic font, but with that great vintage flair. This little birdie card is from a JBS accessory sheet from the Wren collection. It's the one I was desperate to use on my last layout, procession on a dead leg. It was still out on my desk, and was the perfect size and colour and pretty much place itself on the page. Love that! I placed one of the cardstock button stickers from a JBS Hodge Podge sticker sheet on some chipboard, trimmed it out and sanded up the edges to give it a smooth finish, punched holes and threaded with a piece of twine. It fit perfectly inside of the gold foil cigar label! That gold foil piece was from one of those wonderful Making Memories vintage collection packs. I kept most of them together, but a few I disassembled and put into my stash. 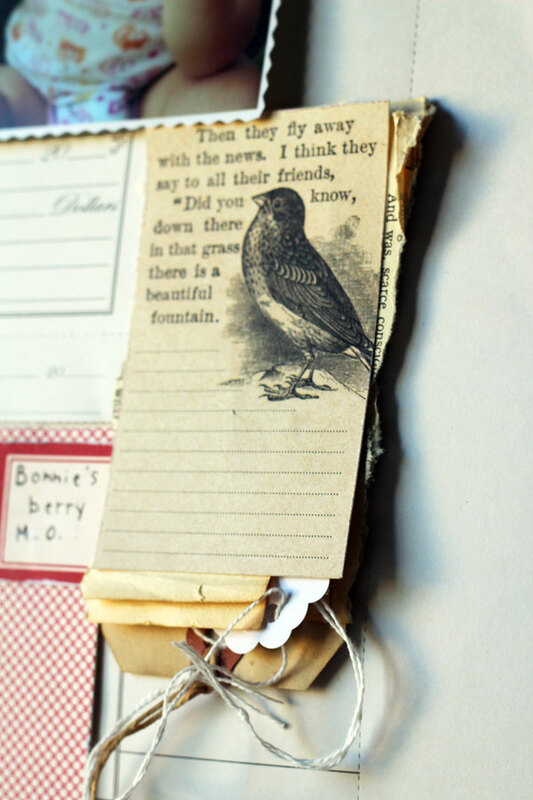 I like to keep a few pieces of random embellishments like this foil piece in little tart tins on my desk, so I can see them when I'm working and add them to a page. I won't go hunting through my entire stash for a random embellishment, but if I see it, I will use it. I cropped the photo with pinking sheers! And put it on pop dots for dimension. 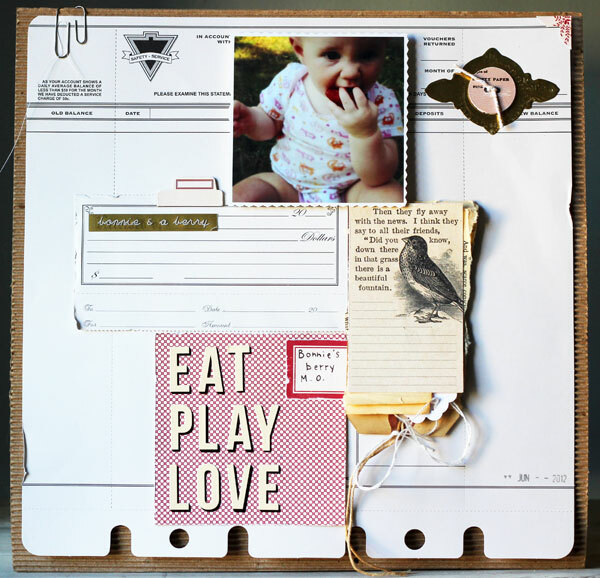 patterned paper (Jenni Bowlin Studio); die cut paper (Jenni Bowlin Studio); tags (Avery); letter stickers (Jenni Bowlin Studio); cardstock stickers (Jenni Bowlin Studios); foil frame (Making Memories); corrugated paper (Fancy Pants); chipboard tab (Jenni Bowlin Studio). I love how this layout is both simple in the color palette and pattern, but at the same time very complex design-wise. I swoon over JB products so your use of it never fails to pull me in for a closer look. And you've got to love your 'pinking shear makes photo pop' idea! Love the layers in this Ashley! Gorgeous!